I like Lifetime movies. I have no shame in my love of Lifetime movies. But today I watched a movie on Lifetime Movie Network that was sooo much better than a Lifetime movie. This movie is proof that you should not turn your nose up at something just because of the channel it is on. Yeah, I’m saying it. Don’t judge a book by its cover and all that jazz. 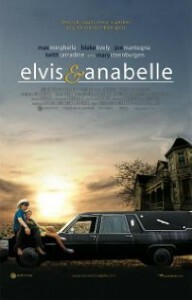 Elvis and Anabelle is one of the best romance movies I’ve seen in a while. I was a little turned off by the opening scene of embalming, simply because the last undertaker movie I watched (After Life) really rubbed me the wrong way. I actually paused it and told myself, “Power through; maybe this character will make it worthwhile.” He did. I had no problems once I got past the opening scene. This is a movie that brings two misfits together when an undertaker’s son (Max Minghella) saves a beauty queen (Blake Lively). I’m hesitant to bring specifics into this for fear of spoiling things, but this romance is really a modern day fairy tale. Though the problem that eventually brings a rift between them seems a little contrived, the chemistry is there, the love is there, and the kindred spirits are believable, despite their very different attitudes and backgrounds. I don’t know much about Blake Lively, as I’ve never gotten into Gossip Girl, but we saw her last weekend in a very different role as a Boston drug addict and tramp in The Town. She is definitely a talented actress with a lot of potential in terms of her range. I also want to make sure to point out amazing side characters—Elvis’s dad (played by Joe Mantegna in the best role I’ve EVER seen him in) and Anabelle’s mom (played by Mary Steenburgen, who I mostly know as Ted Danson’s wife, but she is fantastic in every project she takes on). I’m no expert in terms of cinematography, but I know when I like how something looks. And this movie has some really beautiful scenes in it. The movie becomes progressively lighter (visually and thematically) as it works from beginning to end, and it’s interesting how/when more and more color is introduced. The shots of Elvis’s house and the surrounding area are awesome. This movie makes me want to pack up and go buy a farmhouse in Texas…or maybe just visit sometime. 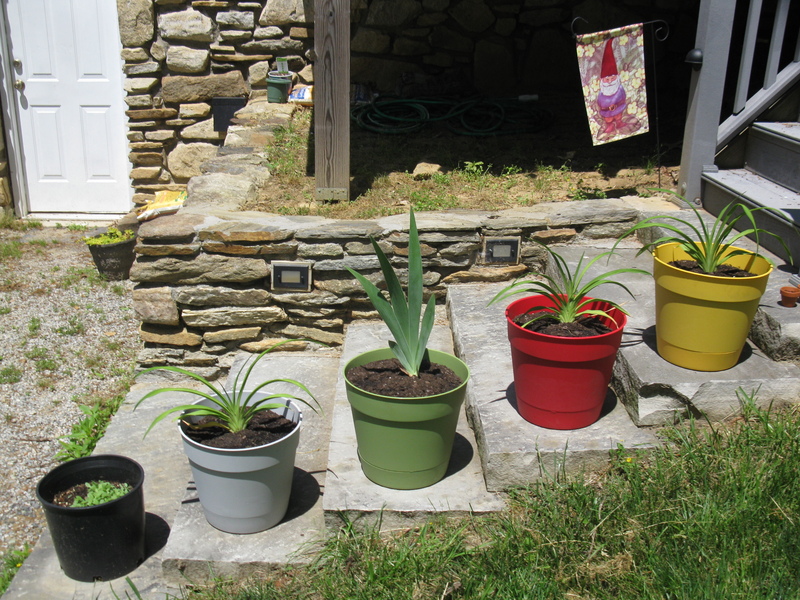 Two thumbs up for Elvis and Anabelle. Keep an eye out for it if you are wanting a nice, relaxing, surprising movie that covers a lot of thematic ground, from suicide to disability to near death experiences to what happens when a Harold meets a Maude. Let’s be honest here. I watched this movie for the title. Darkness is one of my favorite words. I saw this movie on Starz the other day when I was clicking through channels, and I DVRed it, knowing it would be right up my alley. I watched it today because I wanted a break from Lifetime and Melrose Place, and it was the first movie at the top of my DVR list that fit the bill. And Soon the Darkness is a remake of a 1970s British thriller of the same name, which I have not seen and may or may not add to my list. Two women are cycling through Argentina. When one of them goes missing, the other one is left to find her. It’s pretty obvious early on that it’s 1) dangerous for women to be in a foreign country, 2) dangerous for women to be alone in a foreign country, 3) strange foreign men are dangerous. We’re just waiting for one woman to be alone so a man can abduct her. It’s REALLY obvious. Because it’s so in your face from the beginning of this movie that things in Argentina are dangerous, this movie is definitely lacking in the thrills area. I watched a Lifetime movie yesterday called A Deadly Encounter, and this movie (even with its horrible and unintriguing title!) was more suspenseful. I’m not sure where And Soon the Darkness went wrong. The abduction scene wasn’t scary. The rescue scene wasn’t scary. When characters get killed, I’m not scared. I’m just like… well, that’s what happens when you’re in Argentina. Shouldn’t have gone to Argentina. You should’ve gone to Las Vegas. Nothing bad happens in Las Vegas. It’s so unfortunate that this movie falls flat, because the two main lead actresses are actually pretty good. Amber Heard plays the “good girl”, and I saw her (and enjoyed her performance, if you remember) recently in Drive Angry. Odette Yustman (who is now…Odette Annable? Seriously, actresses should only keep their maiden names or hyphenate married names, because it’s confusing) plays the “bad girl”, and I really liked her in The Unborn, which I saw a few years ago and thought was pretty underrated as a horror film. Both Heard and Yustman/Annable played their roles well separately and together, and they are really believable as best friends. I wanted more of them. I empathized with them. But I still wasn’t scared when bad stuff happened to them. So, today brought you a lukewarm review. I don’t want my 90 minutes back, but I’m not sure if I’d recommend it. Lesson learned: Titles can be more interesting than movies. I gave up on Melrose Place for a while. I posted my Season Three review on September 30, 2011. Yeah, last year. After completing that post, I got six or seven episodes into Season Four and just stopped watching. There are a few reasons why this happened. First, I began watching Law and Order (the original) more regularly. 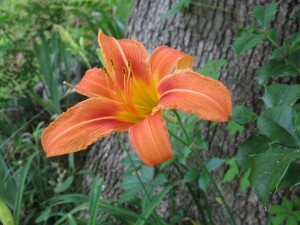 Second, I was preoccupied with submitting poems like a crazy person and helping plan our move. And third, the most important of my reasons for stopping watching Melrose Place, was Brooke. I complained about Kristin Davis in my Season Three review. Her Brooke is manipulative and obnoxious and screws up everything. She is the reason for the two week hiatus I took while watching Season Three, and she is the reason I took this FOUR MONTH hiatus in the middle of Season Four. I can’t stand her. 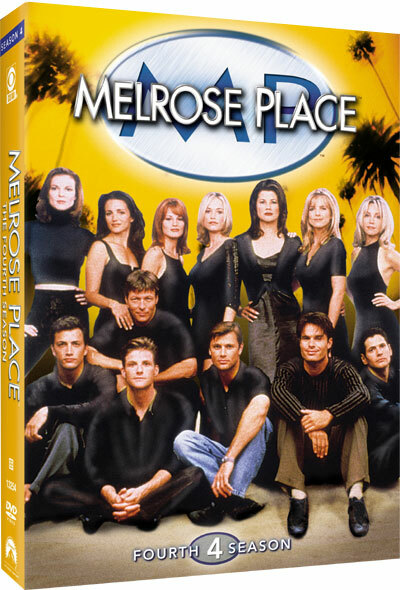 I resumed watching Melrose Place because I finished watching all of the available Law & Order seasons on Netflix streaming (all eight. Where are the other ten+??? That’s for another entry). I watched Melrose Place only out of my Law & Order heartbreak and a sense of obligation to this website, as Melrose-related keywords bring me a lot of traffic for some reason. I powered through only hoping that something could happen. Brooke made everything worse and worse. It even got to the point where none of her fellow characters liked her anymore. I disliked Billy for being a Brooke-fan; once he became a Brooke-hater, I rooted for Billy again. And guess what, the Melrose Gods stepped in and killed her. Brooke is dead. She fell and hit her head. Then she drowned. In the pool. I have wanted a pool death forever! I have been very very careful about avoiding spoilers in all past season reviews, but I don’t even care. I hate her! She’s gone. Since she died, I was able to power through the rest of Season Four easily, watching sometimes four or five episodes in a row without a shred of anxiety or angst. Ignoring Brooke, Season Four isn’t a bad one. Dr. Peter Burns has grown on me. Dr. Mancini is always my favorite, and he had a lot of good moments with his never-changing trio of women: Jane, Sydney, and Kimberly. I also enjoyed some of Jake’s romances this season, and he’s a character I’ve been bored with for a while. Season Four brings a few celebrity cameos (my favorites being Priscilla Presley and Denise Richards) that I wasn’t expecting (perhaps because the show was more successful by this point? ), and I hope that more celebrities show up in Season Five and beyond. So now that I’ve knocked this entry out, I’m starting Season Five immediately. My love for Melrose has been restored. I’m so excited! During our first week living here, we created tons and tons of trash. Boxes, bubble wrap, wadded up balls of tape. You just can’t help the amount you generate when you move. We couldn’t believe it when we called to set up our first trash pickup to find out our home was not eligible. Derrick and I must live a tenth of a mile outside the city limits. This was panic time. We couldn’t live in trash forever! We knew many of our neighbors had trash pickup from private companies, but finding a private company that fit our needs seemed to be much more of a hassle than it was worth. Some required special blue bags. Some required that you own your own trash bins. We couldn’t even compare the companies and cost-effectiveness of each, because all of the requirements were so different. The owners left us a note with helpful Hendersonville tips, and one of them was that if we took equal amounts trash and recyclables to the city dump, it was free. Still, the idea of hauling trash in my little Grand Am didn’t seem ideal. It’s different for van/truck/SUV drivers. I just imagined vegetable juice and litter spilling all over the inside of my trunk. I had tuna salad yesterday with a side of a tortilla. It was good, but I didn’t want the same meal again today for lunch. Inspired by my successful salmon scramble of last week, I thought I’d try bringing egg into the mix. It was a delicious success! The mayonnaise and mustard kept the inside of the omelet flavorful and moist. Pull out two small bowls and a frying pan. Preheat frying pan to medium. Crack two eggs in one bowl and mix with fork. Put tuna in second bowl, and add your desired amount of mayonnaise and mustard. I used a small spoonful of mayonnaise and a dime-sized squirt of mustard. Mix together. You have made tuna salad. When pan is preheated, you are ready to make your omelet. Pour in egg. Hold pan up, and swirl it slowly so egg will reach all edges of the pan in a perfect circle. Replace on burner. Cook until edges begin to curl up and you can slide a spatula under them. You do not want the top of the egg to be wet, but it can still be shiny. When it is dry, spread tuna salad on one half of omelet. Sprinkle cheese on top of the tuna. Fold other half of omelet on top, so you now have a half moon shape and you’ve got the tuna salad and cheese melting yummily on the inside. Cook for one minute. Carefully flip omelet (I had some tuna want to gush out the edges), and cook the other side for one minute. Enjoy! I served with a side of tortilla chips, but a tortilla or a piece of toast would also work well. 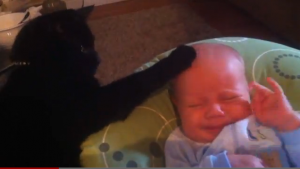 If you finished a can of tuna, let your cat lick the can. We traded in Bridesmaids last night for an in-store movie. We took our time in the store, which was a comfortable temperature and was pretty busy for a Friday night. Derrick was recognized twice by old high school friends (this IS a small town. That would never happen to me in Greensboro!) Trying to select a Blu-Ray instead of a DVD narrowed the field a little bit, and I chose Drive Angry early on as a possible contender. I carried it around the store with me, and Derrick thought I was crazy for thinking this could be our Friday night movie. I suggested several other movies (which I won’t name in case they end up being reviewed), but I was most excited about Drive Angry. I remember seeing the title on our theatre’s marquee last year. I don’t remember ever seeing a trailer for it. But Nic Cage hasn’t steered us wrong lately (I take that back; a few months ago, I DID shut off Season of the Witch 10 minutes in). I didn’t want to pick out a comedy—or rather a comedy that was SUPPOSED to be a comedy. I wanted something fun that we didn’t have to think about too much. I like explosions. Derrick thought I was crazy, but he skeptically went along with me. Drive Angry is probably one of my favorite movies I’ve seen this year…I know 2012 hasn’t been around very long, but still! I don’t want to go into any specifics about plot or characters because I think the surprise worked in the movie’s favor for us. 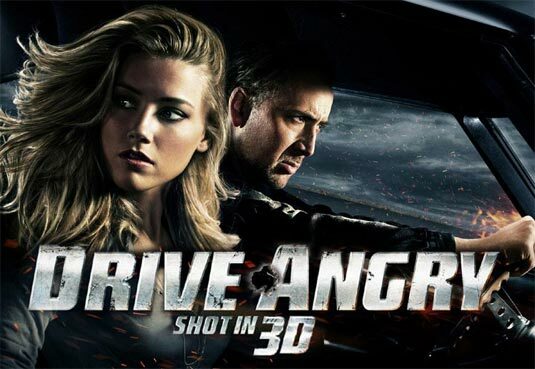 Drive Angry is an over-the-top (purposefully, mind you!) hilarious action movie originally filmed in 3D (expect some of 3D’s cheesy antics, stuff flying at the screen, etc.) There are lots of explosions (YAY!) and goon killings. Nicholas Cage is believable, both tough and compassionate. Amber Heard was a likeable female lead. Derrick’s favorite character was The Accountant, played by William Fichtner (who we know best from Entourage, Go, The Dark Knight, but he’s in a ton of stuff—you’d recognize him if you saw him). About forty minutes into the movie, Derrick looked over at me and asked, “Do you think this movie had the wrong title?” This is a legitimate question. I don’t know what Drive Angry sets you up for, but I imagine it turns some viewers off—Derrick, for example. But ultimately, this was a movie that we both enjoyed, and I’ll end up buying to watch again.